Looks like Harry Potter could become the first film that has managed to sell tie-in merchandise well before the movie even hits these shores. Not bad going for a character straight from the pages of a book. The adventures of Harry Potter managed to shift the reading culture, tearing children away from their Playstations and Gameboy's and plonking them back in the 1920s. Parent's couldn't wait to take their nippers to bed to carry on reading the adventures which they themselves had also become attatched to. 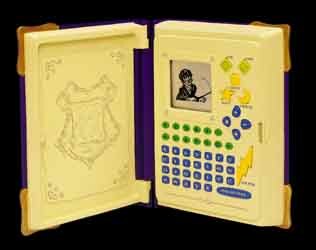 Now Tiger Electronics is helping to entertain our children with the launch of their Book of Spells electronic encyclopedia. By delving into the electronic pages of this 'book' fans can pull out information on the main characters from the novels, list a range of spells and basically spend hours learning about the world of Harry Potter. And in addition they can also play several games that are included. This is a must for young fans.